Nowadays streaming videos to iPad iPhone is welcomed by more video lovers and iPad iPhone users. This article is going to show you how to stream protected DVD to iPad iPhone using a DVD ripper & a video streaming app...So, what are the attractions of video streaming? #1. Playback full-length movies without losing quality. #2. No storage limitations on iPad iPhone - all media sources to be played or have been watched on iPad iPhone are stored on your home PC/Mac hard drive instead of your iDevice. #3. No iTunes syncing is required. #4. Possible to play videos on any device at anywhere, either on a plane, or at a café, or in the bedroom. But how about streaming protected DVD to iPad iPhone? Is that possible? The answer is yes. Only two steps needed to realize this: backup protected DVD to your computer, and then streaming the protected DVD you have ripped to iPad iPhone. 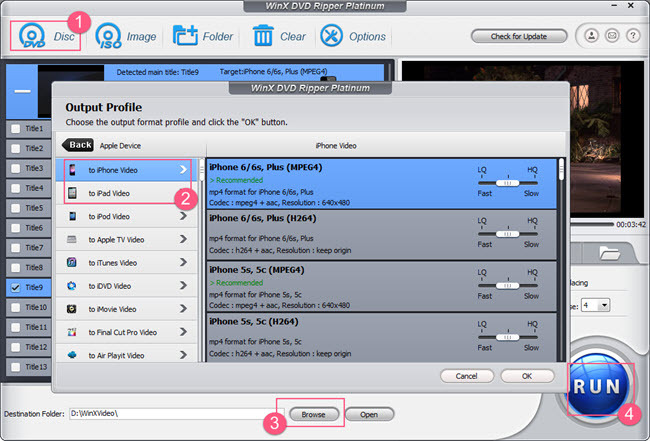 This tool can help rip your copy-protected DVDs to iPhone iPad fully compatible formats easily and quickly. # Download and install WinX DVD Ripper Platinum. # Download and install Air Playit server on your PC/Mac hard drive. # Download Air Playit iPad iPhone client and respectively install on your iPad or iPhone. Step One: Rip protected DVD to iPad iPhone 8. Follow this: launch WinX DVD Ripper Platinum -- import protected DVD disc by pressing "Disc" button -- select "to iPad Video" or "to iPhone Video" – click "Browse" button to choose output location for store the ripped files – click "RUN" to begin ripping protected DVD. As you can see, it's very easy to rip protected DVD to iPhone 6/SE/7/8/X/XS/XR, iPad mini 3/4, iPad Pro/Air 2, and other iOS (12) devices. Step Two: Wirelessly transferring/streaming protected DVD movie to iPad iPhone. 1. Run Air Playit server on PC/Mac hard drive. Click "Add Folder" to add the protected DVD videos you have ripped. 2. Run Air Playit client on your iPad iPhone and add your computer to the server list. 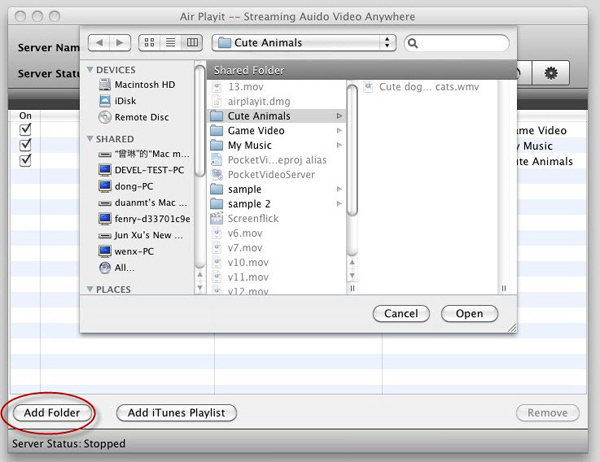 Air Playit will automatically discover server by Apple Bonjour service. Or you can manually add remote server by specifying IP address. 3. Choose one protected DVD video you want to watch and click "Play". Want to play DVD on iPad/Pro/Air/mini freely? Here 3 top-rated DVD to iPad ripper freeware for Windows (10) are shared, with detailed reviews. Get to known how to free rip DVD to USB 3.1/3.0/2.0, USB Type-c flash drive on computer, transfer DVD to digital file (in MP4/AVI etc.) for storing on a USB drive.